Prime Scratch Cards Casino will then reward you with a bonus (Welcome Bonus is for new players only). The terms and conditions of the bonuses vary between different casinos and might also change over time and between different countries, so it is important to compare the different offers and read the T&C for Prime Scratch Cards Casino before signing up. 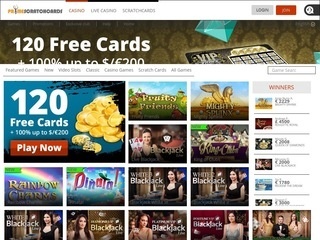 Prime Scratch Cards has earned itself a seal by GoDaddy, which confirms that the online casino is verified and secured by the agency. A devoted advocate for responsible gambling, this online gambling venue protects its users’ personal data with the state-of-the-art 256 bit SSL encryption, so rest assured. Regulated by the two strictest jurisdictions – the UK Gambling Commission and Malta Gaming Authority, Prime Scratch Cards Casino has a reputation to maintain. To enhance convenience, the charming website is available in seven languages: English, German, French, Swedish, Finnish, Norwegian and Russian. The overall organisation of the website is neat and easy to navigate, and all game categories, as well as other compartments (special offers, security and privacy, customer support), are visibly marked on the homepage. Last, but certainly not least, Prime Scratch Cards Casino is mobile-friendly, and all of the games are smoothly accessed from any smartphone or tablet. All games at Prime Scratch Cards Casino are tested and audited for fairness and randomness on a regular basis, which we always like to hear. Fair play is a complete priority if one wants to own a quality online gambling venue. Prime-net holdings LTD Casinos had that in mind when they launched Prime Scratch Cards Casino in 2005. Fathoming a trusty trio of online content suppliers that consists of NetEnt, Neo Games and Amaya, this online casino has some really unique and never seen before titles that will mesmerise you. If diversity is what you are after, you will have it at Prime Scratch Cards Casino! Prime Scratch Cards Casino boasts an extraordinary selection of slot games that will meet the needs of all profiles of players. This NetEnt casino offers a number of popular slots by the famous providers, and while it might not be among the wealthiest slot holders, it is close to the top when it comes to quality slot portfolio. Spinning never ends with Starburst slot, Twin Spin slot, the fiery Elements slot, Monte Carlo, Mythic Maiden, Egyptian Magic and The Grand Crown slot. As you can see, Prime Scratch Cards Casino does not lack in diversity, especially when it comes to the games’ genres. There is something for everybody! Prime Scratch Cards Casino currently does not possess any table games. As you might expect, Prime Scratch Cards Casino is big on scratchers. It prides itself on having over 150 scratch card games, among which are all of the most rewarding titles in the game category. Depending on the theme of your preference, you can play Power Cash, X&O, Sampo, Summer Fun, 7 Boom and a wide selection of VIP games. Other games include instant wins such as Bingo, Golden Island, Lucky Machines, Keno Deluxe, Spin the Gold and Knights Battle. 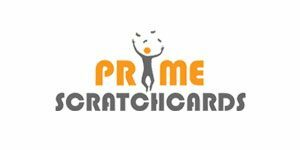 We have not been able to find any live games at Prime Scratch Cards Casino at the moment. However, that did not stop us from enjoying ourselves thoroughly at this online casino. With the impressive offering of slots, and of course, scratch cards in which this casino specialises above all, we had no time to think about live games. Welcoming clients from all over the world, Prime Scratch Cards Casino accepts a big number of foreign currencies, such as Swedish kronor, Norwegian kroner, Brazilian reals and Danish kroner, alongside Dollars (American, Canadian, and Australian) and Euros. Regarding depositing methods, at Prime Scratch Cards Casino you can use over 30 ewallets, credit and debit cards and bank wire transfer. The ewallets include Neteller, Skrill, Trustly, Ukash, EcoPayz, Paysafe Card, EntroPay, iDeal and EnterCash among many others. Withdrawal methods are as per usual slightly narrowed down, but satisfactory nevertheless. Ewallets are leaders in speediness, taking only up to 24 hours to fully process your request. If you are more of a card or bank transfer customer, you might need to wait up to 5 days for the money to land onto your account. Each month, Prime Scratch Cards Casino allows you to withdraw up to 10,000 in your respective currency. Clicking on the ‘Chat with Us’ icon will open the Live Chat feature, through which you can explain any issues you might be experiencing while gambling at Prime Scratch Cards Casino to a professional agent. What we love is that this option is open 24/7, so no time is bad time for questions. You will have your riddles resolved in no time, due to the representatives’ efficiency and responsiveness. Alternatively, you can reach out to the team either via phone or email. Namely, there is a line of phone numbers and email addresses depending on the nature of your enquiry, or the country you are calling from. The general enquiry email address is [email protected] In addition, they are present on social media, so you can search for Prime Scratch Cards on Twitter, Facebook and Google+.